INSERTEC, has participated in the 21st Metal bulleting Recycled Aluminium Conference which has been hold in the Shangri La Hotel, in Dubai, between 3rd and 5th November. Our Colleagues Victor Mendoza and Oscar Iribarren has been present with a booth showing our latest developments in Furnaces and Refractory Solutions for Aluminium Recycling. Oscar Iribarren has also given a lecture named “Preparing the scrap for the furnace: the benefits of decoating with free energy” , related to the IDEX decoating system we are promoting for the scraps recycling and which are being very much appreciated from the market, counting right now with a good number of references and new orders. They mentioned us that the winter weather was lovely there and they are looking forward coming back again. In winter time!!!! The new CLP Regulation (EC 1272 / 2008) on classification, labelling and packaging entered into force on 20 January 2009. The CLP regulation replaces other previous directives and establishes a new criterion of classification, hazard symbols and phrases of danger and caution, for all mixtures that must be introduced no later than the 01.06.2015. Voluntarily, some European manufacturers of silica bodies we have made strides with the new labelling to the year 2015. 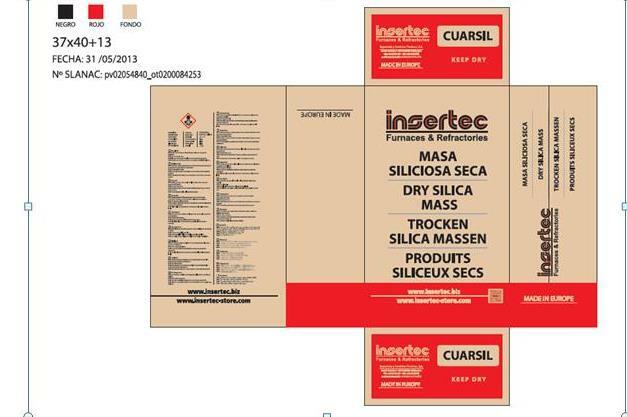 INSERTEC, as a participant in this group, will include in all their bags and BIG BAGS of CUARSIL the pictogram with the Word warning (Warning) and H (indications of danger) and P (safety advice) sentences corresponding. The demolition of the Grace Bridge began in August 2005. It took approximately two years and required closing the shipping lane for half a day so tha the main span could be cut from the cantilever sections, on to a barge below and shipped to mill as raw material. Of the steel used in the bridge, 18,970 tonnes was resulting in a saving of 33,460 tonnes of CO2 that would have resulted from producing new steel from iron ore. Most of the rest of the steel (aproximately 20,000 tonnes) was taken out to sea to form an artificial reef for marine life and to protect the shoreline at the mouth Cooper River. The term steel serves commonly to refer, in metallurgical engineering, an alloy of iron with a quantity of carbon variable between 0.03% to 1,075% by weight of its composition, depending on the grade. it must not be confused with iron steel, the main difference between the two is the percentage of carbon. Last 24st of October the LIII Congress of the Spanish Ceramic & Glass Society (SECV) took place in the School Ceramics of Alcor, in Castelló. Refractories sesion of the event, organized by the Spanish Association of Refractory Manufacturers (ANFRE), showed eleven technical lectures about Spanish raw materials for refractories inn the current crisis moment. This session was managed by our colleague Víctor Mendoza, current Director of the Refractories Group of SECV. One of the lectures was presented by our R&D Manager who presented CUMINER´s exploited quartzite in Guadalajara, as relevant raw material for iron foundry due to its special mineralogy.